Do you want to spend more time outdoors after being inside during long winters like the one we had this year? Would a deck allow you to step outside from your den or family room and enjoy your morning coffee even more? Perhaps you want to relax and enjoy looking at your garden from an elevated vantage point after working in it earlier in the day. Of course, decks can also be wonderful places to entertain friends. Homeowners find an increasing number of uses for decks. All these uses will influence not only the style and dimensions of your deck but also the material chosen. Choosing the right material for your deck will mean years of enjoyment and maintenance ease you didn’t expect. Composites offer a wide choice of colors to homeowners. Homeowners can also select a style for their deck that has the look of wood grain, while not having many of the problems wood has over its lifetime. Issues of warping and cracking have long since been resolved by the industry with newer composite material. This newer combination of wood fiber and resins makes composite decks very strong. A high quality composite deck will not warp, crack or fade. They also stand up well to heavy foot traffic. With the look and feel of real wood, the primary selling point to customers is their low maintenance. Mold and dirt can be cleaned from composite material with a soft bristle brush and mild detergent. Trex® composites are the most requested by homeowners and come with a 25 year limited warranty. Guaranteed from defects in workmanship, splitting, splintering, rot, bug damage and fungal decay Trex composite decks provide peace of mind to homeowners. Because of the initial cost of composite decks, pressure treated wood decks are chosen by many homeowners. Pressure treated wood decks can be either sealed or stained. They are made from Southern Yellow Pine, which lasts for years. Although strong, Southern Yellow Pine wood fibers are porous enough to absorb the preservatives necessary to prevent rotting and most damage from bugs for the life of the wood. 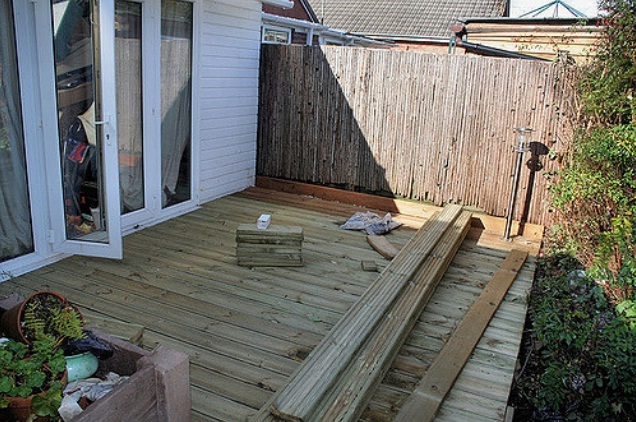 We only use premium grade pressure treated decking for our decks, which improves the quality and look of the deck. Some homeowners stain their deck and others will paint them. Stain can provide you with the grain and color you prefer and enhance the natural characteristics of the wood. Whether a deck is stained or not, experts recommend the wood be sealed. There are three types of sealers and they should be applied every one to three years, depending on the one chosen. Redwood and cedar decks do not last long enough in our humid climate, so we do not recommend them. IPE and other hardwoods make excellent decks, although not often chosen by homeowners. IPE Brazilian hardwood is over 8 times harder than Redwood. Hardwood decks are expensive to build. If the homeowner wants them to take on their natural gray color over time, they are low maintenance as well. The experience is invaluable to customers in helping them design the features they want in their decks and other outdoor living spaces. A professional builder like O’leary & Sons will take into account your existing architecture and ensure your deck will match or complement your home and surroundings.